South View is a substantial Victorian property in Newmarket, located in an unparalleled location backing onto the Long Hill racehorse training grounds with a detached cottage and landscaped garden. Believed to date from the late 19th century, the property is constructed of brick elevations under a slate roof and retains many period features including bay and sash windows, open fireplaces and high ceilings. Accommodation is arranged over three floors (plus cellar) with principal bedrooms and reception rooms benefiting from a south-easterly aspect. There is a lift shaft from the ground to the first floors, which is currently out-of-service. The house offers plenty of scope for modernisation, while the three bedroom cottage is available by separate negotiation. Accommodation in total comprises: reception hall, three reception room, garden room, kitchen/breakfast room, cellar, six bedrooms and three bathrooms. Outside, the established south-east-facing garden backs onto Long Hill racehorse training grounds and has been well maintained with a lawn, flower and shrub beds, a pond and a greenhouse. 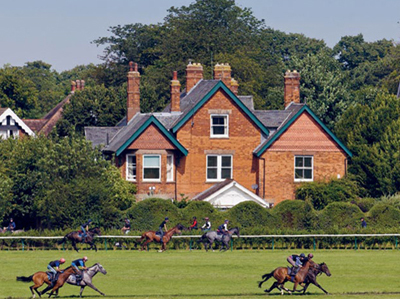 South View occupies an excellent position on the Bury Road, home to some of England’s leading racehorse trainers and some of the finest racing in the world takes place in Newmarket. The guide price is £950,000. For further information please contact Jackson-Stops & Staff on 01638 662231 or visit www.jackston-stops.co.uk.